St. Patrick's Day is a fun celebration even if you're not Irish. As far as I'm concerned...we can all be Irish for a day! In honor of St. Patrick's Day we've got a great recipe to share with all of you! The recipe is courtesy of KRUPS. 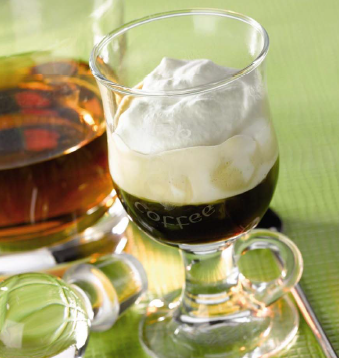 The Irish had the right idea when they combined robust Irish whiskey with hot, black coffee. This hot cocktail has been a long time favorite in Irish pubs but on March 17th, this beverage seems to be a fan favorite around the country. I too like to have an Irish Coffee on St Patrick's Day even though I am not Irish. Sometimes I have it on other days too!